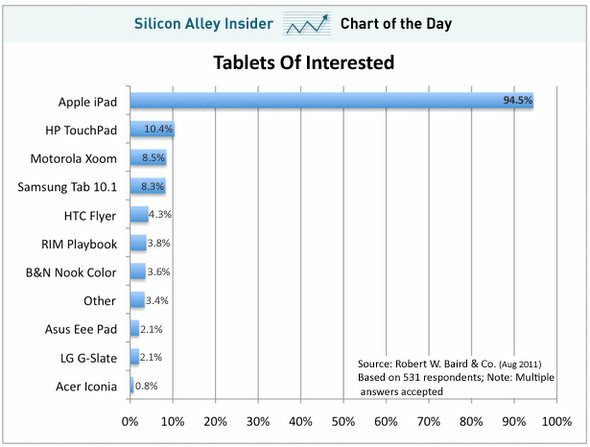 The chart below proves that the iPad is the only tablet anybody really wants. Android tablets get a blips on the chart, but Apple’s iPad is the main player, arguable the only real player, in the tablet space. HP is perhaps the smartest guy in the room right now. With their decision yesterday to stop production of the HP TouchPad, and cease WebOS development, a major player in the tablet market has exited the game (not including Apple). And why, you ask, is this a smart move on HP’s part? Primarily because it shows that right now, HP realizes that Apple has the stage. And instead of pouring massive amounts of money and resources into trying to compete with Apple, HP figures it’ll just focus it’s energy on more profitable ventures. To me, this is pretty smart. The chart below puts the tablet market in perspective. The graph shows, from a consumer interest point of view, what people want the most. And as you can see from the graph, the iPad rules the universe and all other tablets melt away in comparison. The Motorola Xoom is sitting at 8.5% of the tablet market space. And the Xoom is the first tablet running the Honeycomb 3.0 OS – that’s the Android OS that is built specifically for tablets. And obviously, the folks at Google are well aware of these numbers, as are the people at Microsoft. However, I don’t expect Google to back down one bit from their uphill fight to gain a foot in the tablet space. Just like Google responded when the iPhone hit the market in 2007 by coming up with Android OS and releasing smartphones, so it will be with Android tablets. But the list of devices grows for Google’s Android OS, they will need a more standardized Android platform – one that developers can build on equally for the smartphones and for the tablets. Again, just like Apple has done with iOS.